A century ago, the golden age of magazine publishing coincided with the beginning of a golden age of travel. Images of speed and flight dominated the pages of the new mass-market periodicals. Magazines, Travel, and Middlebrow Culture centres on Canada, where commercial magazines began to flourish in the 1920s alongside an expanding network of luxury railway hotels and transatlantic liner routes. The leading monthlies – among them Mayfair, Chatelaine, and La Revue Moderne – presented travel as both a mode of self-improvement and a way of negotiating national identity. This book announces a new cross-cultural approach to periodical studies, reading both French- and English-language magazines in relation to an emerging transatlantic middlebrow culture. Mainstream magazines, Hammill and Smith argue, forged a connection between upward mobility and geographical mobility. Fantasies of travel were circulated through fiction, articles, and advertisements, and used to sell fashions, foods, and domestic products as well as holidays. For readers who could not afford a trip to Paris, Bermuda, or Lake Louise, these illustrated magazines offered proxy access to the glamour and prestige increasingly associated with travel. 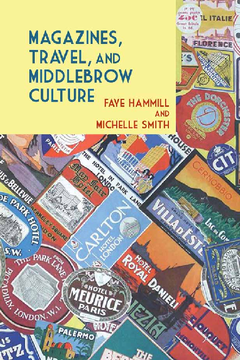 Faye Hammill is Professor of English at the University of Strathclyde and the author of 'Sophistication: A Literary and Cultural History' (Liverpool University Press, 2010). Michelle Smith is Lecturer in English at the University of Strathclyde.